↑ ประกอบด้วยแผ่นโซมาลีซึ่งเกิดแยกตัวออกจากแผ่นแอฟริกา ดู: Chorowicz, Jean (October 2005). "The East African rift system". Journal of African Earth Sciences. 43 (1–3): 379–410. Bibcode:2005JAfES..43..379C. doi:10.1016/j.jafrearsci.2005.07.019. ↑ Aoki, แหล่งข้อมูลทางการของตัวเลขนี้ ใช้ศัพท์ "วินาทีของยูที1" แทนที่ "วินาทีของเวลาสุริยะกลาง".— Seidelmann, S.; Kinoshita, H.; Guinot, B.; Kaplan, G. H.; McCarthy, D. D.; Seidelmann, P. K. (1982). "The new definition of universal time". Astronomy and Astrophysics. 105 (2): 359–61. Bibcode:1982A&A...105..359A. ↑ 1.0 1.1 Standish, E. Myles; Williams, James C. "Orbital Ephemerides of the Sun, Moon, and Planets" (PDF). International Astronomical Union Commission 4: (Ephemerides). สืบค้นเมื่อ 2010-04-03. See table 8.10.2. Calculation based upon 1 AU = 149,597,870,700(3) m.
↑ 2.0 2.1 2.2 2.3 2.4 Staff (2007-08-07). "Useful Constants". International Earth Rotation and Reference Systems Service. สืบค้นเมื่อ 2008-09-23. ↑ 3.00 3.01 3.02 3.03 3.04 3.05 3.06 3.07 3.08 3.09 3.10 3.11 Williams, David R. (2004-09-01). "Earth Fact Sheet". NASA. สืบค้นเมื่อ 2010-08-09. ↑ "Earth Mean Anomaly". Wolfram Alpha. สืบค้นเมื่อ 30 December 2014. ↑ Allen, Clabon Walter; Cox, Arthur N. (2000). Allen's Astrophysical Quantities. Springer. p. 294. ISBN 0-387-98746-0. สืบค้นเมื่อ 2011-03-13. ↑ "Selected Astronomical Constants, 2011". The Astronomical Almanac. สืบค้นเมื่อ 2011-02-25. ↑ Cazenave, Anny (1995). "Geoid, Topography and Distribution of Landforms". In Ahrens, Thomas J. Global earth physics a handbook of physical constants (PDF). Washington, DC: American Geophysical Union. ISBN 0-87590-851-9. Archived from the original (PDF) on 2006-10-16. สืบค้นเมื่อ 2008-08-03. ↑ Humerfelt, Sigurd (October 26, 2010). "How WGS 84 defines Earth". สืบค้นเมื่อ 2011-04-29. ↑ 13.0 13.1 Pidwirny, Michael (2006-02-02). "Surface area of our planet covered by oceans and continents. (Table 8o-1)". University of British Columbia, Okanagan. สืบค้นเมื่อ 2007-11-26. ↑ 14.0 14.1 14.2 Staff (2008-07-24). "World". The World Factbook. Central Intelligence Agency. สืบค้นเมื่อ 2008-08-05. 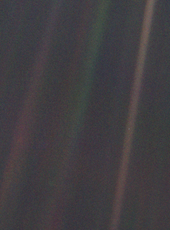 ↑ "Solar System Exploration: Earth: Facts & Figures". NASA. 13 December 2012. สืบค้นเมื่อ 22 January 2012. ↑ Allen, Clabon Walter; Cox, Arthur N. (2000). Allen's Astrophysical Quantities. Springer. p. 296. ISBN 0-387-98746-0. สืบค้นเมื่อ 2010-08-17. ↑ Arthur N. Cox, ed. (2000). Allen's Astrophysical Quantities (4th ed.). New York: AIP Press. p. 244. ISBN 0-387-98746-0. สืบค้นเมื่อ 2010-08-17. ↑ "World: Lowest Temperature". 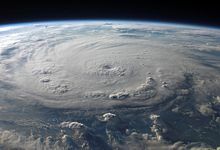 WMO Weather and Climate Extremes Archive. Arizona State University. สืบค้นเมื่อ 2010-08-07. ↑ Kinver, Mark (December 10, 2009). "Global average temperature may hit record level in 2010". BBC Online. สืบค้นเมื่อ 2010-04-22. ↑ "World: Highest Temperature". WMO Weather and Climate Extremes Archive. Arizona State University. สืบค้นเมื่อ 2010-08-07. ↑ National Oceanic and Atmospheric Administration (5 December 2014). "Trends in Atmospheric Carbon Dioxide". Earth System Research Laboratory. ↑ "Age of the Earth". U.S. Geological Survey. 1997. Archived from the original on 23 December 2005. สืบค้นเมื่อ 10 January 2006. ↑ Yoder, Charles F. (1995). T. J. Ahrens, ed. Global Earth Physics: A Handbook of Physical Constants. Washington: American Geophysical Union. p. 8. ISBN 0-87590-851-9. สืบค้นเมื่อ 2007-03-17. ↑ 28.0 28.1 Laskar, J.; และคณะ (2004). "A long-term numerical solution for the insolation quantities of the Earth". Astronomy and Astrophysics. 428 (1): 261–85. Bibcode:2004A&A...428..261L. doi:10.1051/0004-6361:20041335. ↑ National Oceanic and Atmospheric Administration. "Ocean". NOAA.gov. สืบค้นเมื่อ 3 May 2013. Newman, William L. (2007-07-09). "Age of the Earth". Publications Services, USGS. สืบค้นเมื่อ 2007-09-20. Dalrymple, G. Brent (2001). "The age of the Earth in the twentieth century: a problem (mostly) solved". Geological Society, London, Special Publications. 190 (1): 205–21. Bibcode:2001GSLSP.190..205D. doi:10.1144/GSL.SP.2001.190.01.14. สืบค้นเมื่อ 2007-09-20. Stassen, Chris (2005-09-10). "The Age of the Earth". TalkOrigins Archive. สืบค้นเมื่อ 2008-12-30. ↑ Borenstein, Seth (19 October 2015). "Hints of life on what was thought to be desolate early Earth". Excite. Yonkers, NY: Mindspark Interactive Network. Associated Press. สืบค้นเมื่อ 20 October 2015. ↑ Bell, Elizabeth A.; Boehnike, Patrick; Harrison, T. Mark; และคณะ (19 October 2015). "Potentially biogenic carbon preserved in a 4.1 billion-year-old zircon" (PDF). Proc. Natl. Acad. Sci. U.S.A. Washington, D.C.: National Academy of Sciences. 112 (47): 14518–21. Bibcode:2015PNAS..11214518B. doi:10.1073/pnas.1517557112. ISSN 1091-6490. PMC 4664351. PMID 26483481. สืบค้นเมื่อ 20 October 2015. Early edition, published online before print. ↑ Stearns, Beverly Peterson; Stearns, S. C.; Stearns, Stephen C. (1 August 2000). Watching, from the Edge of Extinction. Yale University Press. p. 1921. ISBN 978-0-300-08469-6. สืบค้นเมื่อ 27 December 2014. ↑ Novacek, Michael J. (8 November 2014). "Prehistory's Brilliant Future". New York Times. สืบค้นเมื่อ 25 December 2014. ↑ Miller, G.; Spoolman, Scott (1 January 2012). "Biodiversity and Evolution". Environmental Science. Cengage Learning. p. 62. ISBN 1-133-70787-4. สืบค้นเมื่อ 27 December 2014. ↑ Staff (2 May 2016). 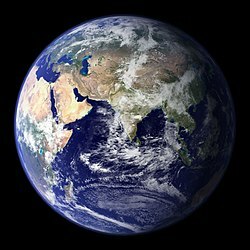 "Researchers find that Earth may be home to 1 trillion species". National Science Foundation. สืบค้นเมื่อ 6 May 2016. ↑ 43.0 43.1 43.2 43.3 43.4 43.5 43.6 43.7 Oxford English Dictionary, 3rd ed. "earth, n.¹" Oxford University Press (Oxford), 2010. ↑ Kleine, Thorsten; Palme, Herbert; Mezger, Klaus; Halliday, Alex N. (2005-11-24). "Hf-W Chronometry of Lunar Metals and the Age and Early Differentiation of the Moon". Science. 310 (5754): 1671–74. Bibcode:2005Sci...310.1671K. doi:10.1126/science.1118842. PMID 16308422. ↑ Reilly, Michael (October 22, 2009). 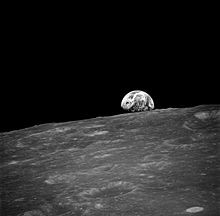 "Controversial Moon Origin Theory Rewrites History". สืบค้นเมื่อ 2010-01-30. ↑ Morbidelli, A.; และคณะ (2000). "Source regions and time scales for the delivery of water to Earth". Meteoritics & Planetary Science. 35 (6): 1309–20. Bibcode:2000M&PS...35.1309M. doi:10.1111/j.1945-5100.2000.tb01518.x. ↑ Staff (March 4, 2010). "Oldest measurement of Earth's magnetic field reveals battle between Sun and Earth for our atmosphere". Physorg.news. สืบค้นเมื่อ 2010-03-27. ↑ Hurley, P. M.; Rand, J. R. (Jun 1969). "Pre-drift continental nuclei". Science. 164 (3885): 1229–42. Bibcode:1969Sci...164.1229H. doi:10.1126/science.164.3885.1229. PMID 17772560. ↑ De Smet, J.; Van Den Berg, A.P. ; Vlaar, N.J. (2000). "Early formation and long-term stability of continents resulting from decompression melting in a convecting mantle". Tectonophysics. 322 (1–2): 19. Bibcode:2000Tectp.322...19D. doi:10.1016/S0040-1951(00)00055-X. ↑ Harrison, T.; และคณะ (December 2005). "Heterogeneous Hadean hafnium: evidence of continental crust at 4.4 to 4.5 ga". Science. 310 (5756): 1947–50. Bibcode:2005Sci...310.1947H. doi:10.1126/science.1117926. PMID 16293721. ↑ Hong, D.; Zhang, Jisheng; Wang, Tao; Wang, Shiguang; Xie, Xilin (2004). "Continental crustal growth and the supercontinental cycle: evidence from the Central Asian Orogenic Belt". Journal of Asian Earth Sciences. 23 (5): 799. Bibcode:2004JAESc..23..799H. doi:10.1016/S1367-9120(03)00134-2. ↑ Armstrong, R. L. (1991). "The persistent myth of crustal growth". Australian Journal of Earth Sciences. 38 (5): 613–30. Bibcode:1991AuJES..38..613A. doi:10.1080/08120099108727995. ↑ Murphy, J. B.; Nance, R. D. (1965). "How do supercontinents assemble?". American Scientist. 92 (4): 324–33. doi:10.1511/2004.4.324. สืบค้นเมื่อ 2007-03-05. ↑ Staff. "Paleoclimatology – The Study of Ancient Climates". Page Paleontology Science Center. สืบค้นเมื่อ 2007-03-02. ↑ Doolittle, W. Ford; Worm, Boris (February 2000). "Uprooting the tree of life" (PDF). Scientific American. 282 (6): 90–95. doi:10.1038/scientificamerican0200-90. PMID 10710791. ↑ 75.0 75.1 75.2 Zimmer, Carl (3 October 2013). "Earth's Oxygen: A Mystery Easy to Take for Granted". New York Times. สืบค้นเมื่อ 3 October 2013. ↑ Burton, Kathleen (2002-11-29). "Astrobiologists Find Evidence of Early Life on Land". NASA. สืบค้นเมื่อ 2007-03-05. ↑ Borenstein, Seth (13 November 2013). "Oldest fossil found: Meet your microbial mom". AP News. สืบค้นเมื่อ 15 November 2013. ↑ Noffke, Nora; Christian, Daniel; Wacey, David; Hazen, Robert M. (8 November 2013). "Microbially Induced Sedimentary Structures Recording an Ancient Ecosystem in the ca. 3.48 Billion-Year-Old Dresser Formation, Pilbara, Western Australia". Astrobiology (journal). 13 (12): 1103–24. Bibcode:2013AsBio..13.1103N. doi:10.1089/ast.2013.1030. PMC 3870916. PMID 24205812. สืบค้นเมื่อ 15 November 2013. ↑ Tyrell, Kelly April (18 December 2017). "Oldest fossils ever found show life on Earth began before 3.5 billion years ago". University of Wisconsin-Madison. สืบค้นเมื่อ 18 December 2017. ↑ Schopf, J. William; Kitajima, Kouki; Spicuzza, Michael J.; Kudryavtsev, Anatolly B.; Valley, John W. (2017). "SIMS analyses of the oldest known assemblage of microfossils document their taxon-correlated carbon isotope compositions". PNAS. 115: 53. doi:10.1073/pnas.1718063115. สืบค้นเมื่อ 19 December 2017. ↑ Gould, Stephan J. (October 1994). "The Evolution of Life on Earth". Scientific American. 271 (4): 84–91. doi:10.1038/scientificamerican1094-84. PMID 7939569. สืบค้นเมื่อ 2007-03-05. ↑ Wilkinson, B. H.; McElroy, B. J. (2007). "The impact of humans on continental erosion and sedimentation". Bulletin of the Geological Society of America. 119 (1–2): 140–56. Bibcode:2007GSAB..119..140W. doi:10.1130/B25899.1. สืบค้นเมื่อ 2007-04-22. ↑ 87.0 87.1 87.2 Sackmann, I.-J. ; Boothroyd, A. I.; Kraemer, K. E. (1993). "Our Sun. III. Present and Future". Astrophysical Journal. 418: 457–68. Bibcode:1993ApJ...418..457S. doi:10.1086/173407. ↑ 88.0 88.1 Britt, Robert (2000-02-25). "Freeze, Fry or Dry: How Long Has the Earth Got?". ↑ 89.0 89.1 Ward, Peter D.; Brownlee, Donald (2002). The Life and Death of Planet Earth: How the New Science of Astrobiology Charts the Ultimate Fate of Our World. New York: Times Books, Henry Holt and Company. ISBN 0-8050-6781-7. ↑ Carrington, Damian (2000-02-21). "Date set for desert Earth". BBC News. สืบค้นเมื่อ 2007-03-31. ↑ Li, King-Fai; Pahlevan, Kaveh; Kirschvink, Joseph L.; Yung, Yuk L. (2009). "Atmospheric pressure as a natural climate regulator for a terrestrial planet with a biosphere" (PDF). Proceedings of the National Academy of Sciences. 106 (24): 9576–79. Bibcode:2009PNAS..106.9576L. doi:10.1073/pnas.0809436106. PMC 2701016. PMID 19487662. สืบค้นเมื่อ 2009-07-19. ↑ Bounama, Christine; Franck, S.; Von Bloh, W. (2001). "The fate of Earth's ocean" (PDF). Hydrology and Earth System Sciences. Germany: Potsdam Institute for Climate Impact Research. 5 (4): 569–75. Bibcode:2001HESS....5..569B. doi:10.5194/hess-5-569-2001. สืบค้นเมื่อ 2009-07-03. ↑ 93.0 93.1 Schröder, K.-P.; Connon Smith, Robert (2008). "Distant future of the Sun and Earth revisited". Monthly Notices of the Royal Astronomical Society. 386 (1): 155. arXiv:0801.4031. Bibcode:2008MNRAS.386..155S. doi:10.1111/j.1365-2966.2008.13022.x. See also Palmer, Jason (2008-02-22). "Hope dims that Earth will survive Sun's death". NewScientist.com news service. สืบค้นเมื่อ 2008-03-24. 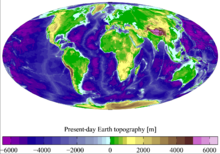 ↑ "Earth2014 global topography (relief) model". Institut für Astronomische und Physikalische Geodäsie. สืบค้นเมื่อ 4 March 2016. ↑ Milbert, D. G.; Smith, D. A. "Converting GPS Height into NAVD88 Elevation with the GEOID96 Geoid Height Model". National Geodetic Survey, NOAA. สืบค้นเมื่อ 2007-03-07. ↑ 96.0 96.1 Sandwell, D. T.; Smith, W. H. F. (2006-07-07). "Exploring the Ocean Basins with Satellite Altimeter Data". NOAA/NGDC. สืบค้นเมื่อ 2007-04-21. ↑ "Is a Pool Ball Smoother than the Earth?" (PDF). Billiards Digest. 1 June 2013. สืบค้นเมื่อ 26 November 2014. ↑ Morgan, J. W.; Anders, E. (1980). "Chemical composition of Earth, Venus, and Mercury". Proceedings of the National Academy of Sciences. 77 (12): 6973–77. Bibcode:1980PNAS...77.6973M. doi:10.1073/pnas.77.12.6973. PMC 350422. PMID 16592930. ↑ One or more of the preceding sentences incorporates text from a publication now in the public domain Chisholm, Hugh, ed. (1911). "Petrology". Encyclopædia Britannica (11th ed.). Cambridge University Press. ↑ Tanimoto, Toshiro (1995). Thomas J. Ahrens, ed. Crustal Structure of the Earth (PDF). Washington, DC: American Geophysical Union. ISBN 0-87590-851-9. Archived from the original (PDF) on 2006-10-16. สืบค้นเมื่อ 2007-02-03. ↑ Kerr, Richard A. (2005-09-26). "Earth's Inner Core Is Running a Tad Faster Than the Rest of the Planet". Science. 309 (5739): 1313. doi:10.1126/science.309.5739.1313a. PMID 16123276. ↑ Robertson, Eugene C. (2001-07-26). "The Interior of the Earth". USGS. สืบค้นเมื่อ 2007-03-24. ↑ 106.0 106.1 Turcotte, D. L.; Schubert, G. (2002). "4". 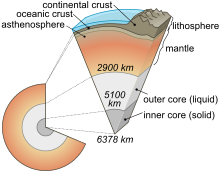 Geodynamics (2 ed.). Cambridge, England, UK: Cambridge University Press. pp. 136–37. ISBN 978-0-521-66624-4. ↑ Sanders, Robert (2003-12-10). "Radioactive potassium may be major heat source in Earth's core". UC Berkeley News. สืบค้นเมื่อ 2007-02-28. ↑ Alfè, D.; Gillan, M. J.; Vocadlo, L.; Brodholt, J.; Price, G. D. (2002). "The ab initio simulation of the Earth's core" (PDF). Philosophical Transactions of the Royal Society. 360 (1795): 1227–44. Bibcode:2002RSPTA.360.1227A. doi:10.1098/rsta.2002.0992. สืบค้นเมื่อ 2007-02-28. ↑ Vlaar, N; Vankeken, P.; Vandenberg, A. (1994). "Cooling of the Earth in the Archaean: Consequences of pressure-release melting in a hotter mantle" (PDF). Earth and Planetary Science Letters. 121 (1–2): 1. Bibcode:1994E&PSL.121....1V. doi:10.1016/0012-821X(94)90028-0. ↑ Brown, W. K.; Wohletz, K. H. (2005). "SFT and the Earth's Tectonic Plates". Los Alamos National Laboratory. สืบค้นเมื่อ 2007-03-02. ↑ Kious, W. J.; Tilling, R. I. (1999-05-05). "Understanding plate motions". USGS. สืบค้นเมื่อ 2007-03-02. ↑ Seligman, Courtney (2008). "The Structure of the Terrestrial Planets". Online Astronomy eText Table of Contents. cseligman.com. สืบค้นเมื่อ 2008-02-28. ↑ Duennebier, Fred (1999-08-12). "Pacific Plate Motion". University of Hawaii. สืบค้นเมื่อ 2007-03-14. ↑ Mueller, R. D.; และคณะ (2007-03-07). "Age of the Ocean Floor Poster". NOAA. สืบค้นเมื่อ 2007-03-14. ↑ Bowring, Samuel A.; Williams, Ian S. (1999). "Priscoan (4.00–4.03 Ga) orthogneisses from northwestern Canada". Contributions to Mineralogy and Petrology. 134 (1): 3. Bibcode:1999CoMP..134....3B. doi:10.1007/s004100050465. ↑ Meschede, Martin; Barckhausen, Udo (2000-11-20). "Plate Tectonic Evolution of the Cocos-Nazca Spreading Center". Proceedings of the Ocean Drilling Program. Texas A&M University. สืบค้นเมื่อ 2007-04-02. ↑ Staff. "GPS Time Series". NASA JPL. สืบค้นเมื่อ 2007-04-02. ↑ "CIA – The World Factbook". Cia.gov. สืบค้นเมื่อ 2 November 2012. ↑ Kring, David A. "Terrestrial Impact Cratering and Its Environmental Effects". Lunar and Planetary Laboratory. สืบค้นเมื่อ 2007-03-22. ↑ Staff. "Layers of the Earth". Volcano World. สืบค้นเมื่อ 2007-03-11. ↑ Jessey, David. "Weathering and Sedimentary Rocks". Cal Poly Pomona. สืบค้นเมื่อ 2007-03-20. ↑ "World Bank arable land". World Bank. สืบค้นเมื่อ 19 October 2015. ↑ "World Bank permanent cropland". World Bank. สืบค้นเมื่อ 19 October 2015. ↑ "7,000 m Class Remotely Operated Vehicle KAIKO 7000". Japan Agency for Marine-Earth Science and Technology (JAMSTEC). สืบค้นเมื่อ 2008-06-07. ↑ Charette, Matthew A.; Smith, Walter H. F. (June 2010). "The Volume of Earth's Ocean" (PDF). Oceanography. 23 (2): 112–14. doi:10.5670/oceanog.2010.51. สืบค้นเมื่อ 2013-06-06. ↑ Mullen, Leslie (2002-06-11). "Salt of the Early Earth". NASA Astrobiology Magazine. สืบค้นเมื่อ 2007-03-14. ↑ Morris, Ron M. "Oceanic Processes". NASA Astrobiology Magazine. สืบค้นเมื่อ 2007-03-14. ↑ Scott, Michon (2006-04-24). "Earth's Big heat Bucket". NASA Earth Observatory. สืบค้นเมื่อ 2007-03-14. ↑ Sample, Sharron (2005-06-21). "Sea Surface Temperature". NASA. สืบค้นเมื่อ 2007-04-21. ↑ Geerts, B.; Linacre, E. (November 1997). "The height of the tropopause". Resources in Atmospheric Sciences. University of Wyoming. สืบค้นเมื่อ 2006-08-10. ↑ 144.0 144.1 Staff (2003-10-08). "Earth's Atmosphere". NASA. สืบค้นเมื่อ 2007-03-21. ↑ Pidwirny, Michael (2006). "Fundamentals of Physical Geography (2nd Edition)". 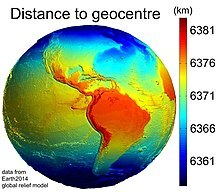 PhysicalGeography.net. สืบค้นเมื่อ 2007-03-19. ↑ 147.0 147.1 Moran, Joseph M. (2005). "Weather". World Book Online Reference Center. NASA/World Book, Inc. สืบค้นเมื่อ 2007-03-17. ↑ 148.0 148.1 Berger, Wolfgang H. (2002). "The Earth's Climate System". University of California, San Diego. สืบค้นเมื่อ 2007-03-24. ↑ Rahmstorf, Stefan (2003). "The Thermohaline Ocean Circulation". Potsdam Institute for Climate Impact Research. สืบค้นเมื่อ 2007-04-21. ↑ Various (1997-07-21). "The Hydrologic Cycle". University of Illinois. สืบค้นเมื่อ 2007-03-24. ↑ Staff. "Climate Zones". UK Department for Environment, Food and Rural Affairs. สืบค้นเมื่อ 2007-03-24. ↑ "Why U.S. East Coast is colder than Europe's West Coast". Live Science. 5 April 2011. สืบค้นเมื่อ 7 July 2015. ↑ "Earth at Aphelion". Space Weather. July 2008. สืบค้นเมื่อ 7 July 2015. ↑ Staff (2004). "Stratosphere and Weather; Discovery of the Stratosphere". Science Week. สืบค้นเมื่อ 2007-03-14. ↑ de Córdoba, S. Sanz Fernández (2004-06-21). "Presentation of the Karman separation line, used as the boundary separating Aeronautics and Astronautics". Fédération Aéronautique Internationale. สืบค้นเมื่อ 2007-04-21. ↑ Abedon, Stephen T. (1997-03-31). "History of Earth". Ohio State University. สืบค้นเมื่อ 2007-03-19. ↑ Fitzpatrick, Richard (2006-02-16). "MHD dynamo theory". NASA WMAP. สืบค้นเมื่อ 2007-02-27. ↑ 165.0 165.1 McElroy, Michael B. (2012). 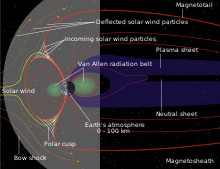 "Ionosphere and magnetosphere". Encyclopædia Britannica. Encyclopædia Britannica, Inc.
↑ Masson, Arnaud (11 May 2007). "Cluster reveals the reformation of the Earth's bow shock". European Space Agency. สืบค้นเมื่อ 16 August 2016. ↑ Gallagher, Dennis L. (14 August 2015). "The Earth's Plasmasphere". NASA/Marshall Space Flight Center. สืบค้นเมื่อ 16 August 2016. ↑ Gallagher, Dennis L. (27 May 2015). "How the Plasmasphere is Formed". NASA/Marshall Space Flight Center. สืบค้นเมื่อ 16 August 2016. ↑ Stern, David P. (2005-07-08). "Exploration of the Earth's Magnetosphere". NASA. สืบค้นเมื่อ 2007-03-21. ↑ "Leap seconds". Time Service Department, USNO. สืบค้นเมื่อ 2008-09-23. ↑ Staff. "IERS Excess of the duration of the day to 86400s ... since 1623". 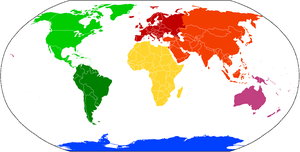 International Earth Rotation and Reference Systems Service (IERS). สืบค้นเมื่อ 2008-09-23. —Graph at end. ↑ Staff. "IERS Variations in the duration of the day 1962–2005". International Earth Rotation and Reference Systems Service (IERS). Archived from the original on 2007-08-13. สืบค้นเมื่อ 2008-09-23. ↑ 179.0 179.1 Williams, David R. (2006-02-10). "Planetary Fact Sheets". NASA. สืบค้นเมื่อ 2008-09-28. —See the apparent diameters on the Sun and Moon pages. ↑ Williams, David R. (2004-09-01). "Moon Fact Sheet". NASA. สืบค้นเมื่อ 2007-03-21. ↑ Vázquez, M.; Rodríguez, P. Montañés; Palle, E. (2006). "The Earth as an Object of Astrophysical Interest in the Search for Extrasolar Planets" (PDF). Instituto de Astrofísica de Canarias. สืบค้นเมื่อ 2007-03-21. ↑ Astrophysicist team (2005-12-01). "Earth's location in the Milky Way". NASA. สืบค้นเมื่อ 2008-06-11. ↑ Bromberg, Irv (2008-05-01). "The Lengths of the Seasons (on Earth)". University of Toronto. สืบค้นเมื่อ 2008-11-08. ↑ Lin, Haosheng (2006). "Animation of precession of moon orbit". Survey of Astronomy AST110-6. University of Hawaii at Manoa. สืบค้นเมื่อ 2010-09-10. ↑ Fisher, Rick (1996-02-05). "Earth Rotation and Equatorial Coordinates". National Radio Astronomy Observatory. สืบค้นเมื่อ 2007-03-21. ↑ Williams, Jack (2005-12-20). "Earth's tilt creates seasons". USAToday. สืบค้นเมื่อ 2007-03-17. ↑ Staff (September 2003). "Astrobiology Roadmap". NASA, Lockheed Martin. สืบค้นเมื่อ 2007-03-10. ↑ Dole, Stephen H. (1970). Habitable Planets for Man (2nd ed.). American Elsevier Publishing Co. ISBN 0-444-00092-5. สืบค้นเมื่อ 2007-03-11. ↑ Lambin, Eric F.; Meyfroidt, Patrick (1 March 2011). "Global land use change, economic globalization, and the looming land scarcity" (PDF). Proceedings of the National Academy of Sciences of the United States of America. National Academy of Sciences. 108 (9): 3465–72. Bibcode:2011PNAS..108.3465L. doi:10.1073/pnas.1100480108. สืบค้นเมื่อ 30 August 2014. See Table 1. ↑ Staff (2006-11-24). "Mineral Genesis: How do minerals form?". Non-vertebrate Paleontology Laboratory, Texas Memorial Museum. สืบค้นเมื่อ 2007-04-01. ↑ Rona, Peter A. (2003). "Resources of the Sea Floor". Science. 299 (5607): 673–74. doi:10.1126/science.1080679. PMID 12560541. สืบค้นเมื่อ 2007-02-04. ↑ Staff (2007-02-02). "Evidence is now 'unequivocal' that humans are causing global warming – UN report". United Nations. Archived from the original on 21 December 2008. สืบค้นเมื่อ 2007-03-07. ↑ "Various '7 billionth' babies celebrated worldwide". สืบค้นเมื่อ 2011-10-31. ↑ Staff. 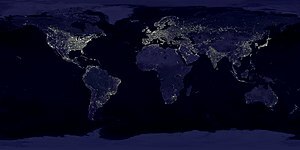 "World Population Prospects: The 2006 Revision". United Nations. Archived from the original on 5 September 2009. สืบค้นเมื่อ 2007-03-07. ↑ Staff (2007). "Human Population: Fundamentals of Growth: Growth". Population Reference Bureau. สืบค้นเมื่อ 2007-03-31. ↑ Peel, M. C.; Finlayson, B. L.; McMahon, T. A. (2007). "Updated world map of the Köppen-Geiger climate classification". Hydrology and Earth System Sciences Discussions. 4 (2): 439–73. doi:10.5194/hessd-4-439-2007. สืบค้นเมื่อ 2007-03-31. ↑ Staff. "Themes & Issues". Secretariat of the Convention on Biological Diversity. สืบค้นเมื่อ 2007-03-29. ↑ Staff (2006-08-15). "Canadian Forces Station (CFS) Alert". Information Management Group. สืบค้นเมื่อ 2007-03-31. ↑ "U.N. Charter Index". United Nations. Archived from the original on 20 February 2009. สืบค้นเมื่อ 2008-12-23. ↑ Staff. "International Law". United Nations. Archived from the original on 31 December 2009. สืบค้นเมื่อ 2007-03-27. ↑ Wade, Mark (2008-06-30). "Astronaut Statistics". Encyclopedia Astronautica. สืบค้นเมื่อ 2008-12-23. ↑ "Reference Guide to the International Space Station". NASA. 2007-01-16. สืบค้นเมื่อ 2008-12-23. ↑ Cramb, Auslan (2007-10-28). "Nasa's Discovery extends space station". Telegraph. สืบค้นเมื่อ 2009-03-23. ↑ Espenak, F.; Meeus, J. (2007-02-07). 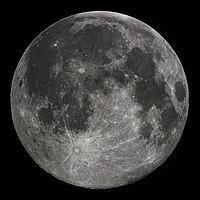 "Secular acceleration of the Moon". NASA. สืบค้นเมื่อ 2007-04-20. ↑ Poropudas, Hannu K. J. (1991-12-16). "Using Coral as a Clock". Skeptic Tank. สืบค้นเมื่อ 2007-04-20. ↑ Murray, N.; Holman, M. (2001). "The role of chaotic resonances in the solar system". Nature. 410 (6830): 773–79. arXiv:astro-ph/0111602. doi:10.1038/35071000. PMID 11298438. ↑ Whitehouse, David (2002-10-21). "Earth's little brother found". BBC News. สืบค้นเมื่อ 2007-03-31. ↑ Christou, Apostolos A.; Asher, David J. (March 31, 2011). "A long-lived horseshoe companion to the Earth". arΧiv:1104.0036 [astro-ph.EP]. See table 2, p. 5. ↑ Connors, Martin; Wiegert, Paul; Veillet, Christian (July 27, 2011). "Earth's Trojan asteroid". Nature. 475 (7357): 481–83. Bibcode:2011Natur.475..481C. doi:10.1038/nature10233. PMID 21796207. สืบค้นเมื่อ 2011-07-27. ↑ Choi, Charles Q. (July 27, 2011). "First Asteroid Companion of Earth Discovered at Last". Space.com. สืบค้นเมื่อ 2011-07-27. ↑ "2006 RH120 ( = 6R10DB9) (A second moon for the Earth?)". Great Shefford Observatory. Great Shefford Observatory. Archived from the original on 6 February 2015. สืบค้นเมื่อ 17 July 2015. ↑ "UCS Satellite Database". Nuclear Weapons & Global Security. Union of Concerned Scientists. January 31, 2011. สืบค้นเมื่อ 2011-05-12. ↑ "Orbital Debris Quarterly News" (PDF). Vol. 20 no. 3. NASA. July 2016. p. 8. สืบค้นเมื่อ 10 October 2016. ↑ 223.0 223.1 Stookey, Lorena Laura (2004). Thematic Guide to World Mythology. Westport, Conn.: Greenwood Press. pp. 114–15. ISBN 978-0-313-31505-3. ↑ Lovelock, J.E. ; Margulis, L. (1974). "Atmospheric homeostasis by and for the biosphere: the Gaia hypothesis". Tellus. Series A. Stockholm: International Meteorological Institute. 26 (1–2): 2–10. Bibcode:1974Tell...26....2L. doi:10.1111/j.2153-3490.1974.tb01946.x. ISSN 1600-0870. สืบค้นเมื่อ 20 October 2012. ↑ Russell, Jeffrey B. "The Myth of the Flat Earth". American Scientific Affiliation. สืบค้นเมื่อ 2007-03-14. ; but see also Cosmas Indicopleustes. ↑ Godwin, William (1876). "Lives of the Necromancers". p. 49. ↑ Arnett, Bill (July 16, 2006). "Earth". The Nine Planets, A Multimedia Tour of the Solar System: one star, eight planets, and more. สืบค้นเมื่อ 2010-03-09. ↑ Cahalan, Rose (5 June 2012). "Neil deGrasse Tyson: Why Space Matters". The Alcalde. สืบค้นเมื่อ 21 January 2016. Earth – Temperature and Precipitation Extremes – NCDC. หน้านี้แก้ไขล่าสุดเมื่อวันที่ 17 เมษายน 2562 เวลา 05:33 น.